Wudeward is a leading commercial supplier of Wisconsin Urban Wood lumber for architects, designers, builders and wood product producers. We are working to transform our community’s fallen or condemned trees into functional, beautiful hardwood products that can once again breathe life into our neighborhood. A distinctive hardwood with a low environmental impact, Wisconsin Urban Wood makes a significant and beautiful contribution to any LEED® project, sustainable design, or locally-sourced construction. As your urban wood steward, we leverage a statewide network to meet customer needs for rough sawn lumber, flooring, and millwork. We also consult for onsite tree diversion. Every year, trees from our streets, backyards, and parks are removed due to storms, construction, or insects. Help divert this durable, beautiful, truly local resource into higher use. The Wisconsin Urban Wood movement is made up of arborists, mill shops, architects, and consumers who come together to advance the sustainable recovery and best reuse of urban trees. Discover the potential second life local trees can offer residences, businesses, and public spaces as fine lumber, furniture, flooring, art, and architecture. Urban Wood creates community and discussion. Contact us we’d love to hear about your upcoming project. "Without Dwayne’s long-term persistence in the pursuit of Urban Wood, the lumber we lovingly place in our buildings would still be limited to normal, unsustainable sources." "The use of urban ash in our Mequon cafe creates beauty and interest visually, but also tells a deeper story of the material choice and its origin." "It’s a great service to assure that the resources in our community are being sustainably recovered and used for their highest and best use!" "Dwayne has been leading a behavior change that will be yielding benefits well beyond our existence!" "Dwayne routinely goes above and beyond to help us source unique materials for our commercial projects in quantities either large or small." Aaron Tvrdy, Icon Modern, Inc.
"The products Wudeward has created from this still valuable wood are beautiful. They add a wonderful story to an interior environment." 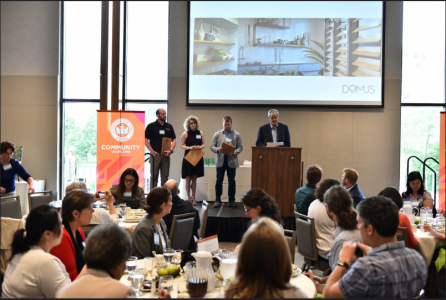 "Dwayne Sperber has been a tireless advocate for the use of urban wood as a viable building material and his company fills an important role in the sustainable building industry."